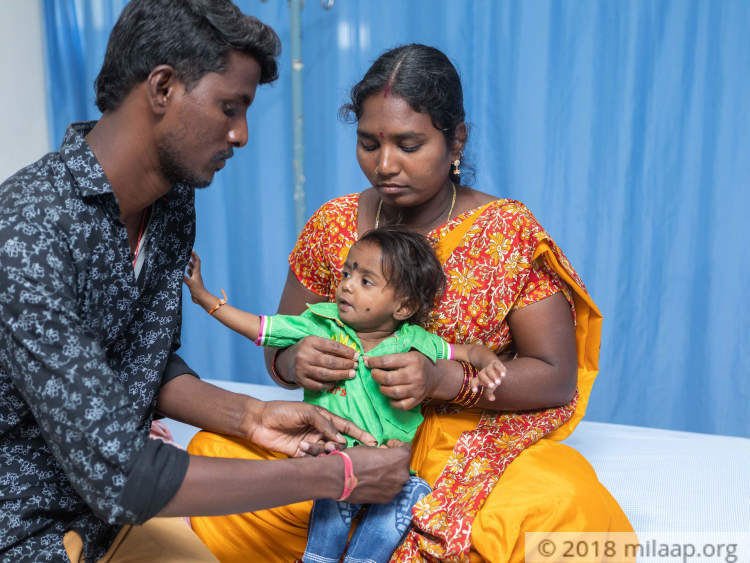 "He is 1-year-old and he has been in hospital more than at home. His tummy has bloated to the size of a football and it doesn't allow him to stand up well on his own. He wants to, but he has no strength or energy for it. He has fallen down a lot of times while learning to walk and the liver infections made his condition worse. We have never heard him laugh, all he has experienced in this world is pain." 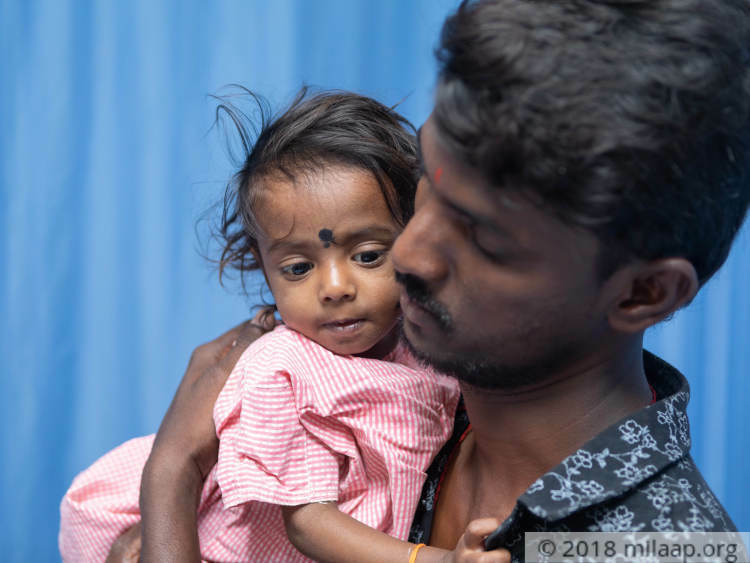 - Shekhar, Father of 1-year-old Lokesh. Shekhar, a cab driver managed to feed his family of five with his meager income. He worked day and night to support his family and lived a modest life. Lokesh is the youngest of all and he was the apple of their eyes. 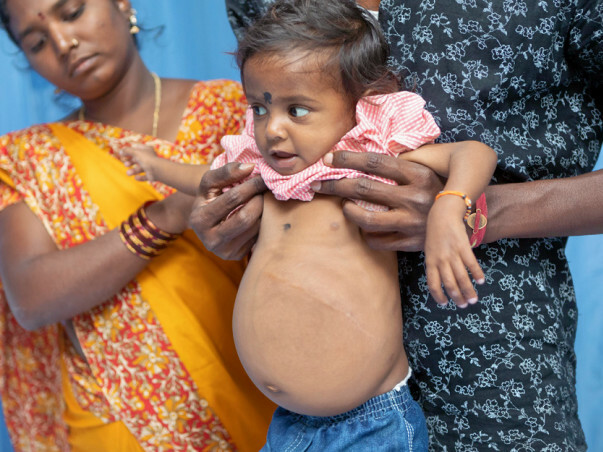 Within few days of his birth, his stomach kept swelling. Parents did not anticipate anything serious. Unfortunately, he was diagnosed with Biliary Artesia, a disorder in which the bile ducts become inflamed, blocking the flow of bile from the liver to the intestines. The blockage can cause liver damage and interfere with digestion and other metabolic processes. 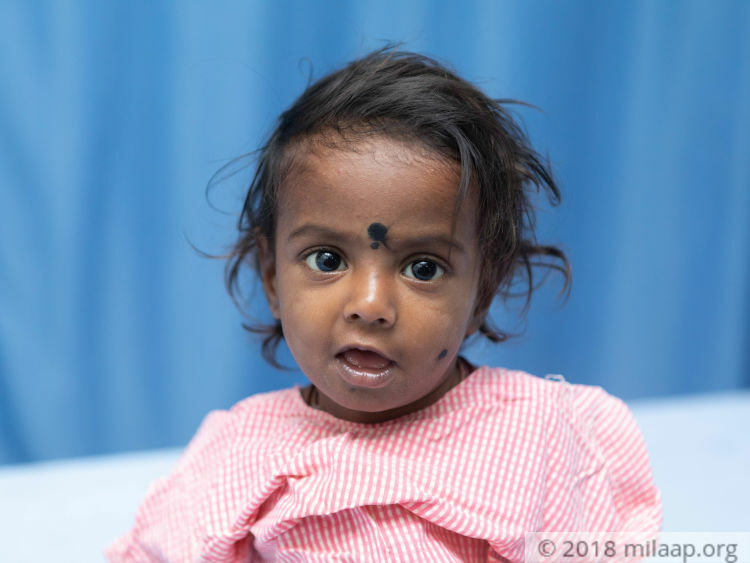 "When doctors told me that he needs an immediate surgery, I was devastated; he was just 3-months-old. I was not able to bear the pain that he is going through. His stools were white in color, he could hardly feed. The growing tummy was scary. I was scared to even hold him in my arms. I was scared that I would hurt him. I was hopeful that with this surgery all our pain and trauma would come to an end, but I was wrong. That painful surgery was only a temporary relief for him." - Balamani, Mother. 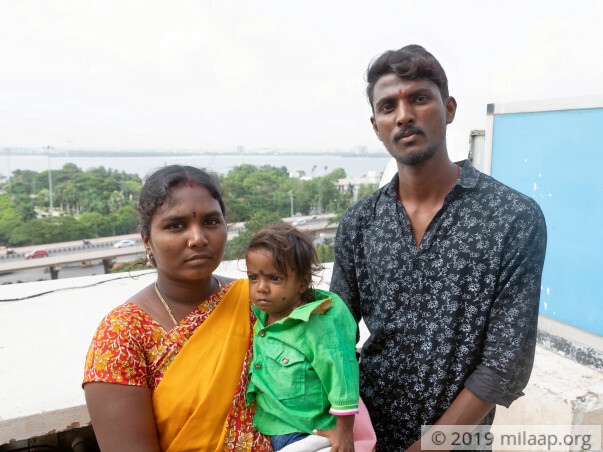 Little Lokesh spent only few months living a normal life. The Kasai procedure done to prevent liver damaged was not successful. 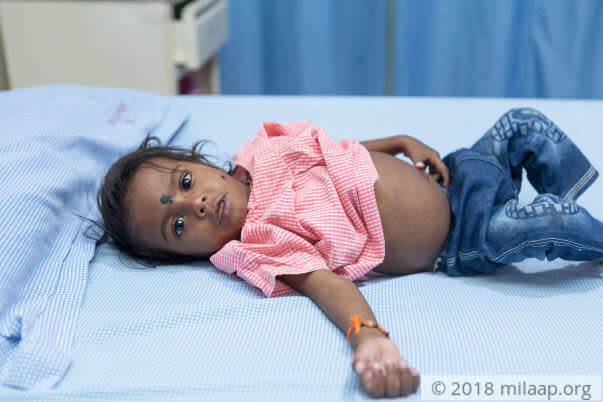 Those familiar dreadful symptoms started again and poor Lokesh has been in constant pain since then. 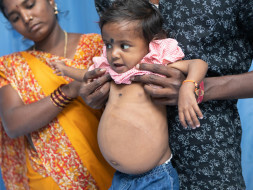 An extremely distended belly from his liver and spleen made his condition worse. His parents were terrified when he began to threw up blood. "We just began to breathe after his surgery but he was soon admitted to hospital again and ever since that our life has been a roller coaster. It hurts me when others look at him differently. No one has taken him in their arms. What is more hurting is to watch him going through so much of pain helplessly. He has not had even one meal properly. He threw up whatever little he eats and he hardly sleeps in the night. He is losing weight drastically but the swelling in his tummy keeps growing. Doctors said his liver is damaged completely and only a transplant can save him." - Balamani. Shekar is a cab driver who earns Rs 9000 per month. Ever since Lokesh's birth his expense just multiplied. Despite so many struggles, he has never given up. He has always made sure to buy all the medicines prescribed for Lokesh. He has lost count on the money he borrowed, he is buried in debt but he was always hopeful that one day his son would live a normal life. Now he is slowly losing hope, he feels completely lost. 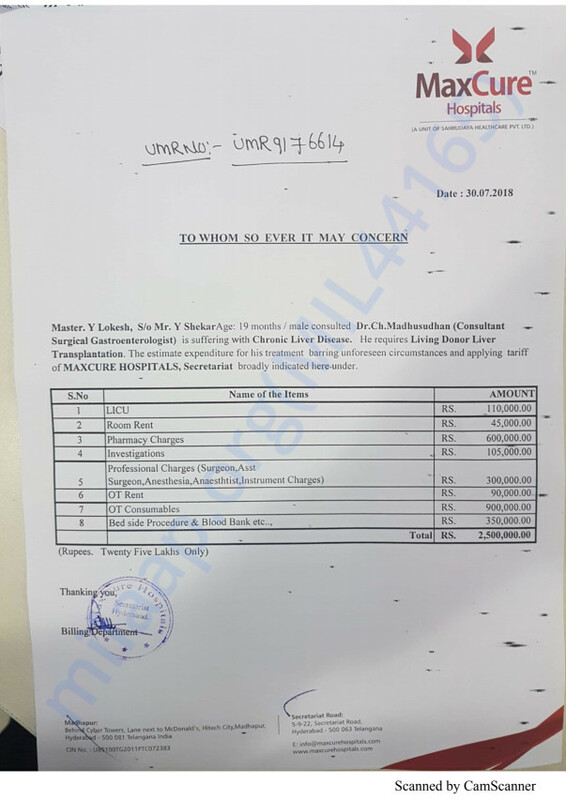 The cost for the transplant is just beyond his capacity. "For poor people like us, health is our only asset. My only in aim in life is to provide my children good health and education. I want them to live a comfortable life unlike us. But everything is upside down now. My son is fighting for his life, I couldn't send my other children to school because I don't have money for anything. I can't bear to lose my child. He deserves a life but there is nothing I could do." - Shekhar. 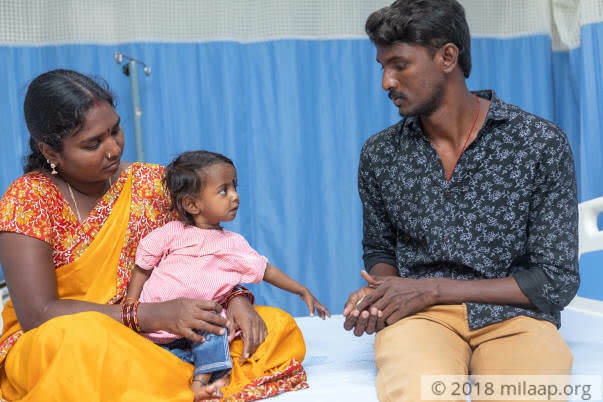 1-year-old Lokesh has been suffering from a liver disease since his birth. He is in constant pain and only an urgent transplant can save his life. His aunt (mother's sister) is a matching donor but his parents keep postponing the transplant due to lack of money. 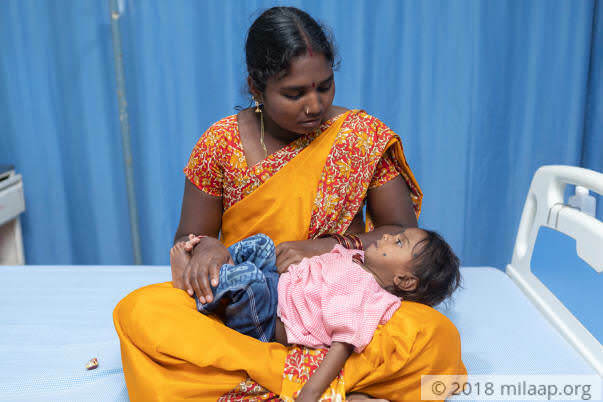 Little Lokesh is running out of time and his parents are dying inside every minute seeing his condition. His father, a poor driver needs your help to save him. Lokesh is currently at home and medical management in going on for him. His transplant is till in the line and we're waiting for funds. 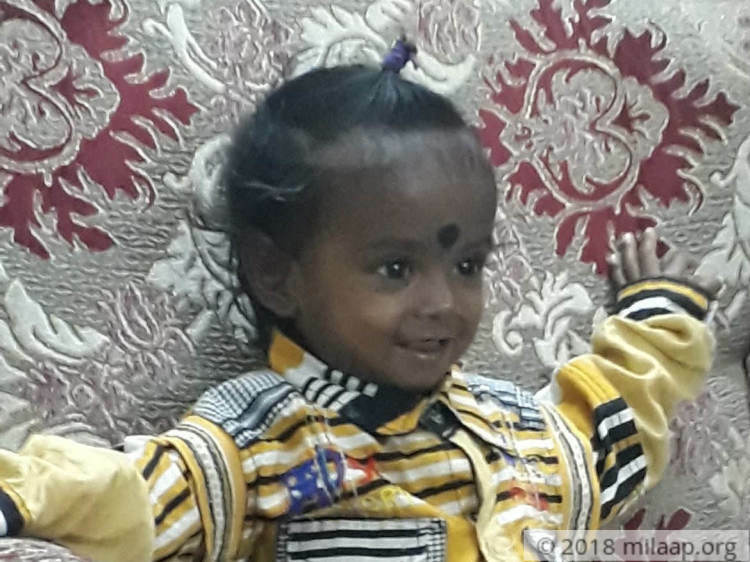 Doctors have tested his maternal aunt as a potential donor. We're really thankful for your support up till now, we request you to please share this campaign among your family and friends.